You can find lots of tips for great places to watch Wishes at Magic Kingdom, but it's difficult to find alternative spots for watching IllumiNations. 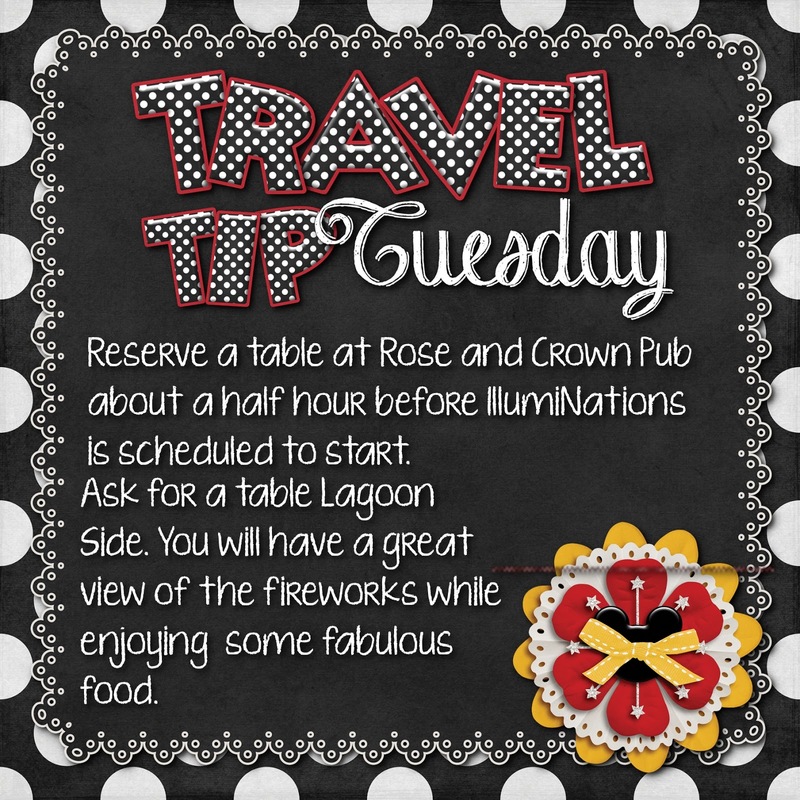 About a half hour before fireworks are scheduled to begin snag a spot at Rose and Crown at a Lagoon Side table. You can also grab a late night snack at Mexico's Cantina on the opposite side of the Lagoon. Do you have a great Travel Tip you would love to share with Guru Donna Kay readers? You can email me at disneydonnakay@yahoo.com and if I use your tip you will get a free Disney vinyl decal. Another great tip - use a Disney Authorized Vacation Planner like Guru Travel! When you're ready to starting planning your own Magical Disney Vacation, I would love to help! Want all the best tips and tricks for making the most of your Disney vacation? Overwhelmed by all of the information that's out there? As a member of the Guru Travel team, I will help you plan your most Magical Vacation ever!! I will work with you to create a realistic budget to fit your travel needs, help with advance dining reservations, daily itineraries and FastPass+ choices, then I send a personalized itinerary book filled with tips from my personal experience traveling to Disney with your final documents. If you are considering a trip to Disney email me at donnakay@thewdwguru,com, call me at 877-825-6146 ext 706 or click the button to the right for a quote sheet. I will be back in touch right away so we can plan the perfect Disney vacation for your family within your budget.